The petrous apex lies at the anterior superior portion of the temporal bone. Access to this region is difficult and often requires special surgical skills. The region is associated with severe life-threatening complications of otitis media. Improvements in antibiotic therapy, surgery for chronic otitis media, and the development of tympanostomy tubes have decreased incidence of suppurative petrous apicitis. Neoplastic and inflammatory lesions are the most common pathologic processes in the petrous apex. Imaging studies have greatly increased the ability to diagnose these lesions, especially in view of the often-vague symptomatology associated with these lesions. A number of the processes are diagnosed as incidental findings, and consultation is sought to determine the appropriate diagnosis and therapeutic plan. See the image below. Petrous apicitis. An axial CT scan of the temporal bone shows an air-fluid level within the right petrous apex and fluid within the middle ear space and mastoid. Classic studies detailing the anatomy of the apex and development of improved surgical techniques, including the operating microscope and facial nerve monitor, permit access to the region while lowering the morbidity and mortality associated with surgery. Stereotactic radiation is a relatively new therapeutic tool that offers nonsurgical hope for treating some tumors. Diagnostic evaluation and treatment plan determination for the lesions are dynamic processes that have changed significantly over the past 20 years, and they should change significantly over the next 20 years. For excellent patient education resources, visit eMedicineHealth's Ear, Nose, and Throat Center and Cholesterol Center. Also, see eMedicineHealth's patient education articles Earache, Hearing Loss, and Cholesterol FAQs. Petrous apex lesions were primarily diagnosed as complications of chronic otitis media. Sophisticated imaging techniques, such as CT scanning and MRI, were not yet available, and the diagnosis was based on clinical findings, oftentimes correlating with a severe life-threatening scenario. Tympanostomy tubes, antibiotics, operating microscopes, drills, facial nerve monitors, and electroencephalography were not yet available. Pediatric wards were filled with children with intracranial complications secondary to chronic otitis media, including petrous apicitis. These lesions of the apex were evaluated by a careful history coupled with a thorough physical examination. Standard radiography, including Towne and Stenver views, coupled with polytomography permitted evaluation of the apex. Clinical suspicions were correlated with autopsy findings in fatal cases. The advent of improved imaging studies, such as CT scanning and MRI, allowed accurate diagnosis of lesions of the petrous apex. Infectious lesions can cause meningitis, brain abscess, cranial nerve disorders, and other severe life-threatening problems. The infection must be treated promptly and aggressively to prevent adverse sequelae. In some cases, antimicrobial therapy alone is sufficient to resolve the infection. In most cases, however, surgical drainage of the abscess cavity facilitates recovery. Skull base osteomyelitis is a severe infection of the temporal bone that requires an extended course of antibiotics. Immunocompromised individuals are most susceptible to these severe infections, but these infections can occur in people with healthy immune systems. Inflammatory lesions generally produce symptoms through the mass effect of the tumor. The apex hosts or borders several important structures discussed in Relevant Anatomy. If these lesions continue to expand, function is progressively sacrificed. Neoplastic lesions, although rarely malignant, produce symptoms by mass effect and through direct invasion. The natural history of the disease must be thoroughly understood in order to make the correct clinical decisions. Vascular lesions produce symptoms by interrupting blood supply, by bleeding, or by producing a mass effect from the aneurysm or blood. Lesions of the petrous apex are classified as infectious, inflammatory, neoplastic, and vascular abnormalities. The natural history of these disease processes can cause significant morbidity and mortality. The lesions most commonly observed in the petrous apex are listed below. Lesions of the petrous apex remain relatively rare. Infectious causes are decreasing because of improved antibiotic therapy, improved techniques in chronic ear surgery, earlier and more frequent placement of tympanostomy tubes, and improved imaging studies leading to earlier diagnosis, ie, before the apex is affected. Inflammatory tumors remain infrequent, and major referral centers report few cases over several years. Neoplastic tumors of the apex also occur only rarely. Some neurootologists do not encounter a chordoma over the course of years of busy clinical practice. Skull base osteomyelitis secondary to otitis externa is common in elderly people who are immunocompromised, especially those with diabetes mellitus. Younger individuals who are immunocompromised also experience this disorder. Vascular tumors are extremely rare, with fewer than 50 cases reported in the literature. However, incidental findings are becoming more common because the routine use of CT and MRI. The increased quality of these imaging studies and the ability to get details previously unavailable oftentimes finds abnormalities in the petrous apex. The etiology of the lesion requires a careful evaluation with occasional use of serial imaging studies to determine whether the lesion is growing. Infectious petrositis generally is secondary to eustachian tube dysfunction causing chronic otitis media, with or without cholesteatoma. Infectious petrositis is also secondary to acute otitis media with subsequent extension to an aerated petrous apex. The pathogens are assumed to be identical to those causing otitis media. Cholesterol granulomas are believed to be secondary to chronic otitis media. A giant cell reaction ensues, and hemoglobin is broken down to form cholesterol debris. Congenital cholesteatomas are secondary to trapped or misplaced ectoderm. Acquired cholesteatomas are secondary to eustachian tube dysfunction that cause retraction or to abnormal epithelial migration from tympanic membrane perforations or retractions. Skull base osteomyelitis is secondary to a severe otitis externa, most commonly in patients who are immunocompromised. The remaining disorders in the apex are idiopathic. Petrous apicitis is a bacterial infection secondary to chronic otitis media, with or without cholesteatoma. This disease process is secondary to poor eustachian tube function. The process occurs after the air in the middle ear space is resorbed and a relative vacuum occurs. A bacteria-infected effusion follows and spreads to the apex through air cell tracts connecting the apex to the middle ear or mastoid. With cholesteatomas, the tympanic membrane becomes retracted from the negative pressure. The retraction becomes deeper, squamous epithelium accumulates in the retraction pocket, and enzymes in the leading edge of the cholesteatoma erode bone. Bacteria through the middle ear colonize the pocket, and suppuration occurs. Skull base osteomyelitis is a severe complication of otitis externa in immunocompromised patients. Inflammatory lesions are often secondary to eustachian tube dysfunction. Congenital cholesteatomas are from retained ectoderm. The pathophysiology of neoplastic lesions is uncontrolled growth with invasion or pressure on the surrounding structures. The etiology of nasopharyngeal carcinoma is associated with the Epstein-Barr virus. The presenting symptoms of lesions of the petrous apex can be specific, readily directing attention to the apex, or these symptoms can be vague and nonspecific, not clearly calling attention to the skull base. Some lesions are diagnosed as incidental findings on imaging studies for nonrelated symptoms. Symptoms related to the apex are attributable to the mass effect of an expansile lesion. In 1904, Gradenigo described a syndrome of abducens nerve palsy, pain secondary to gasserian ganglion inflammation, and facial nerve palsy from suppurative otitis media. The abducens nerve is affected as it passes inferior to the petroclinoid ligament. Facial pain or disturbance of the trigeminal nerve distribution occurs secondary to involvement of the trigeminal nerve at the Meckel cave. Facial paralysis is secondary to inflammation of the facial nerve in the temporal bone. Pain, usually around the eye, is an early symptom that is followed by the cranial neuropathies. Several other symptoms from lesions of the petrous apex are common. Hearing loss occurs secondary to an effusion from eustachian tube dysfunction, ossicular erosion from chronic otitis media, or sensorineural hearing loss secondary to invasion of the otic capsule or the cochleovestibular nerve. Tinnitus and vertigo can also occur along with or independent of hearing loss. Facial paralysis occurs secondary to pressure on the facial nerve anywhere throughout its course in the temporal bone, especially near the geniculate ganglion. Headaches occur from distortion of the dura near the lesion. The headaches are primarily retro-orbital or at the vertex. Syncope, stroke, or amaurosis fugax occur secondary to carotid artery occlusion. Other cranial neuropathies occur with posterior lesions that affect cranial nerves VIII through XII or with anterior lesions that affect cranial nerves II-VI. Interpreting indications for treating these lesions involves a careful risk and benefit analysis based on the symptoms, extent of disease, and natural history of the disease. Options for treating these lesions include observation, medical therapy, surgical therapy, and stereotactic radiation. Each disease process behaves differently, and specific treatment options for each lesion are discussed. The 4 parts of the temporal bone are the petrous, squamous, tympanic, and mastoid portions. The petrous portion (ie, petrosa) is a 4-sided (ie, quadrilateral) pyramid with its apex anteromedial and its base posterolateral. The clivus anteromedially and the otic capsule posterolaterally border the apex. The abducens, or sixth cranial nerve, travels with the inferior petrosal sinus and enters the cavernous sinus through a dural fold between the petroclival ligament and a notch in the petrosphenoid joint called the Dorello canal. The posterior rim lies in a horizontal plane that articulates with the occipital bone to form the jugular foramen, near the opening of the cochlear aqueduct. The anterior rim articulates with the sphenoid bone and houses the anterior orifice of the carotid canal medially. In the late 1930s and early 1940s, Lindsay performed several temporal bone studies examining the various tracts between the mastoid and petrous apex. [3, 4] He also examined the comparative anatomy of the apex. The petrous apex can be extensively pneumatized or unpneumatized, with bone marrow that fills the bone. About 20-30% of apices are pneumatized. Most apices are relatively symmetric between the right and left side, essentially having the same amount of pneumatization or marrow formation. Asymmetric marrow formation can be mistaken for tumor. An extensive 3-dimensional understanding of the anatomy of the temporal bone is absolutely necessary to surgically address disorders of the petrous apex. This region is filled with critical structures that are unforgiving to subtle mistakes in surgical technique or to those not intimately acquainted with the anatomy. With the exception of petrous apicitis and skull base osteomyelitis, all lesions of the petrous apex are best treated surgically. Stereotactic radiation with increased dosage at the tumor and less to the surrounding brain promises a role in treating neoplastic lesions of the apex. Combined therapy with surgery followed by stereotactic radiation are undergoing several controlled studies to determine its efficacy in treating both primary and metastatic lesions. Dublin AB, Bhimji SS. Anatomy, Head, Face, Temporal Region. 2018 Jan. [Medline]. [Full Text]. Gradenigo G. Sulla leptominingite circiscritta e sulla paralisi dell' abducente di origine otitica. G Acad Med Torino. 1904. 10:59. Lindsay JR. Suppuration of the petrous apex. Ann Otol Rhinol Laryngol. 1938. 47:3-36. Lindsay JR. Petrous pyramid of temporal bone: Pneumatization and roentgenologic appearance. Arch Otolaryngol. 1940. 31:231-235. Malone A, Bruni M, Wong R, Tabor M, Boyev KP. Pneumatization Patterns of the Petrous Apex and Lateral Sphenoid Recess. J Neurol Surg B Skull Base. 2017 Dec. 78 (6):441-6. [Medline]. Jacob CE, Rupa V. Infralabyrinthine approach to the petrous apex. Clin Anat. 2005 Sep. 18(6):423-7. [Medline]. Jackler RK, Parker DA. Radiographic differential diagnosis of petrous apex lesions. Am J Otol. 1992 Nov. 13(6):561-74. [Medline]. Wachter D, Behm T, Gilsbach JM, Rohde V. Neurosurgical strategies and operative results in the treatment of tumors of or extending to the petrous apex. Minim Invasive Neurosurg. 2011 Apr. 54(2):55-60. [Medline]. Yang J, Ma SC, Fang T, Qi JF, Hu YS, Yu CJ. Subtemporal transpetrosal apex approach: study on its use in large and giant petroclival meningiomas. Chin Med J (Engl). 2011 Jan. 124(1):49-55. [Medline]. Montgomery MM. Cystic lesions of the petrous apex: transphenoidal approach. Ann Otol. 1977. 86:429-435. Fucci MJ, Romanczuk BJ, Bell RD. Superior sagittal sinus thrombosis after radical neck dissection. Skull Base Surgery. 1994. 4(1):41-45. Negm HM, Singh H, Dhandapani S, Cohen S, Anand VK, Schwartz TH. Landmarks to Identify Petrous Apex Through Endonasal Approach Without Transgression of Sinus. J Neurol Surg B Skull Base. 2018 Apr. 79 (2):156-60. [Medline]. Giddings NA, Brackmann DE, Kwartler JA. Transcanal infracochlear approach to the petrous apex. Otolaryngol Head Neck Surg. 1991 Jan. 104(1):29-36. [Medline]. Eytan DF, Kshettry VR, Sindwani R, et al. Surgical outcomes after endoscopic management of cholesterol granulomas of the petrous apex: a systematic review. Neurosurg Focus. 2014 Oct. 37(4):E14. [Medline]. Leonetti JP, Anderson DE, Marzo SJ, Origitano TC, Schuman R. The preauricular subtemporal approach for transcranial petrous apex tumors. Otol Neurotol. 2008 Apr. 29(3):380-3. [Medline]. Sweeney AD, Osetinsky LM, Carlson ML, et al. The Natural History and Management of Petrous Apex Cholesterol Granulomas. Otol Neurotol. 2015 Dec. 36 (10):1714-9. [Medline]. Goiney C, Bhatia R, Auerbach K, Norenberg M, Morcos J. Intraosseous schwannoma of the petrous apex. J Radiol Case Rep. 2011. 5(11):8-16. [Medline]. [Full Text]. Petrous apicitis. A coronal CT scan of the temporal bones shows an air-fluid level in the right petrous apex. Cholesterol cyst. A coronal T1-weighted image of the temporal bone shows high-intensity signal in the left petrous apex. Cholesterol cyst. An axial T2-weighted image shows a lesion in the left petrous apex. Trigeminal schwannoma. An axial T1-weighted MRI shows an enhanced lesion of the left petrous apex. Chondrosarcoma. An axial T1-weighted MRI image with gadolinium shows an enhanced mass in the petrous apex. Nasopharyngeal carcinoma. An axial CT scan of the temporal bones shows a mass in the nasopharynx. Nasopharyngeal carcinoma. 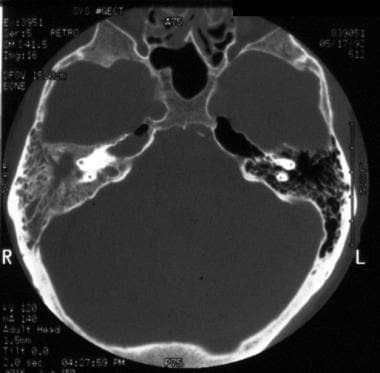 An axial CT scan of the temporal bones shows an erosive and invasive mass of the left petrous apex. Basal cell carcinoma. An axial T1-weighted MRI shows an isointense lesion of the left temporal bone that invaded the petrous apex. Sigmoid sinus obstruction. An MRI venogram shows no flow in the left sigmoid sinus.